Per his military service record (regimental no. 2708), Archibald McIntyre enlisted twice in the AIF. Archibald McIntyre was born at Glasgow, Scotland. On his first enlistment (during the Coo-ee March), he gave his age as 31 years and 6 months, his marital status as single, and his occupation as labourer. His description on his medical was height 5 feet 2 inches tall, weight 9 stone 10 lbs., with a dark complexion, brown eyes, and dark hair. His religious denomination was Church of England. He claimed that he had no previous military service. He completed his medical on the 26th October 1915 at Blayney, and was attested by Captain Eade at Blayney on the 26th October 1915. Whilst at Liverpool Camp Private McIntyre went before a medical board on 17th November 1915 where he was deemed unfit for military service due to defective vision. He was discharged on the 29th November 1915. In a letter dated 16th April 1916 Archibald McIntyre wrote “I was rejected for eyesight but as they have reduced the test I intend to give it another try”. On the 19th May 1916 Archibald McIntyre applied again to join the AIF. He attended the Royal Agricultural Showground in Sydney, and stated in this application that he had 35 days previous military service in the AIF, and was rejected on grounds of eyesight. He underwent a medical on the 19th May 1916 which he passed. He was attested on the 20th May 1916 at the Royal Agricultural Showground. Private McIntyre went into camp and began training at Cootamundra on the 23rd May 1916, then to Goulburn on the 22nd June 1916. He remained at Goulburn till the 4th September 1916 when he was transferred to the 56th Battalion and went to Sydney being taken on strength of the 6th reinforcements for the Battalion. On his embarkation roll his address at time of enrolment was Portland N.S.W., and his next of kin is listed as father, William McIntyre, 161 Pollok Street, Glasgow, Scotland. Private McIntyre departed Sydney on the HMAT A40 Ceramic on the 7th October 1916. He arrived in Plymouth, England, on the 21st November 1916. After further training in England he departed Folkestone, England, aboard the SS Princess Victoria for France on the 21st December 1916. 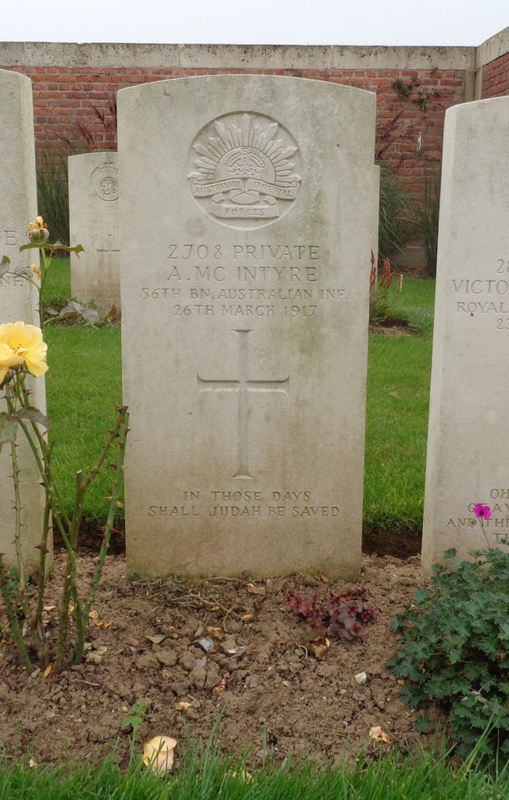 He underwent further training in France at the 5th Australian Division Base Depot at Etaples. He joined the 56th Battalion on 1st February 1917 whilst it was in reserve and providing fatigue parties at Bernafay south of Pozieres, France. On the 22nd March 1917 the 56th Battalion was in reserve in the vicinity of Bancourt, France, when Private McIntyre was evacuated to hospital sick. On the 24th March 1917 he was diagnosed to be suffering from Bronchitis. On the 25th March at the 2nd/1st South Midland Casualty Clearing Station Private McIntyre was diagnosed with Cerebro Spinal Meningitis. He died the next day. Private McIntyre was buried in the Puchevillers British Cemetery, France, on 26th March 1917. Private McIntyre’s name is commemorated on panel 162 on the Australian War Memorial First World War Roll of Honour. 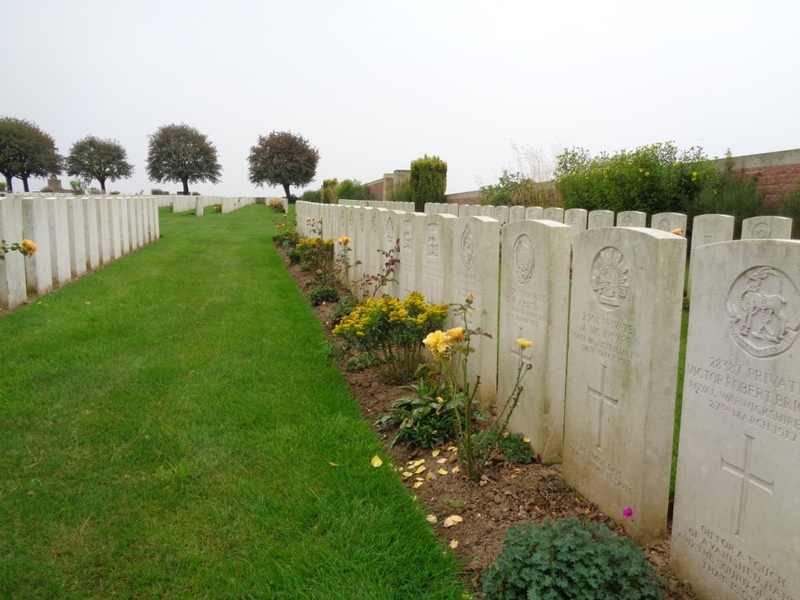 On 5th September 2014 Stephen and I drove to Puchevillers British Cemetery, which is located near the village of Puchevillers, which is about 19 km north-east of Amiens. According to the Commonwealth War Graves Commission website http://www.cwgc.org/, the 3rd and 44th Casualty Clearing Stations came to Puchevillers in June 1916 just before the start of the Battle of the Somme, and used Plots 1 to 5, and almost all of Plot 6 until March 1917. The cemetery was then used by the 2nd/1st South Midland Casualty Clearing Station for the next two months. Plot 7 contains mostly the graves of soldiers who died in the German advance in 1918. There are 1,763 First World War soldiers buried in this cemetery. Archibald McIntyre, a labourer on enlistment per his service record, who joined the Coo-ees at Blayney, is the only Coo-ee buried in this cemetery (in Plot 6). He died of illness on 26th May 1917. The photograph below shows Private McIntyre’s grave (2nd from the right) at Puchevillers British Cemetery. A photograph of the headstone on Archibald McIntyre’s grave will be placed on his individual blog entry, and form part of a Roll of Honour for the fallen Coo-ees on this blog.